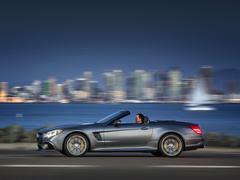 Refreshed, redesigned and reengineered, but which of the two AMG SLs comes out on top? 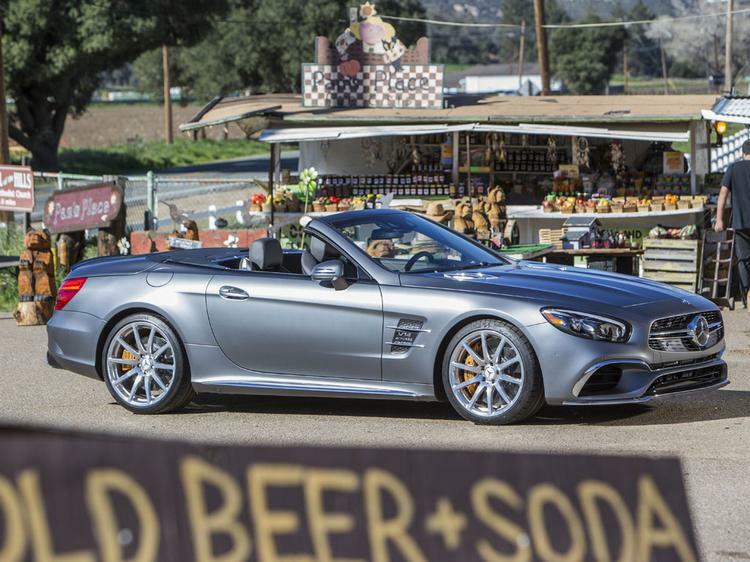 There is absolutely no logical reason for the Mercedes-AMG SL65 to exist. In the most basic terms your £59,195 premium over the £114,100 SL63 buys you some bigger numbers on the spec sheet, 'my engine's bigger than yours and I've got the badges to prove it' bragging rights ... and a single tenth off the 0-62mph sprint. The bigger story on this launch of the refreshed R231 SL is in the 'civilian' non-AMG cars and their adoption of new tech like nine-speed gearboxes and optional get yer knee down Curve Tilt Function. 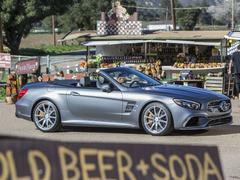 And you can read our review of the SL500 here. 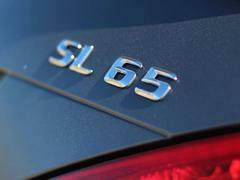 But before we drive that car by some quirk of fate we first alight, magpie like, beside the chrome-emboldened splendour of £173,295's worth (plus undisclosed options) of SL65 AMG, key in hand. 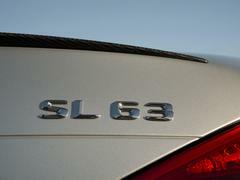 Neatly proving why - logic be damned - the SL65 needs to exist. Because whether you're an undeserving hack on a launch, or an actual real-life buyer with cash money, the natural instinct is to go for the flashiest, fastest and most expensive one you can. But is it actually the best? We'll come back to that. 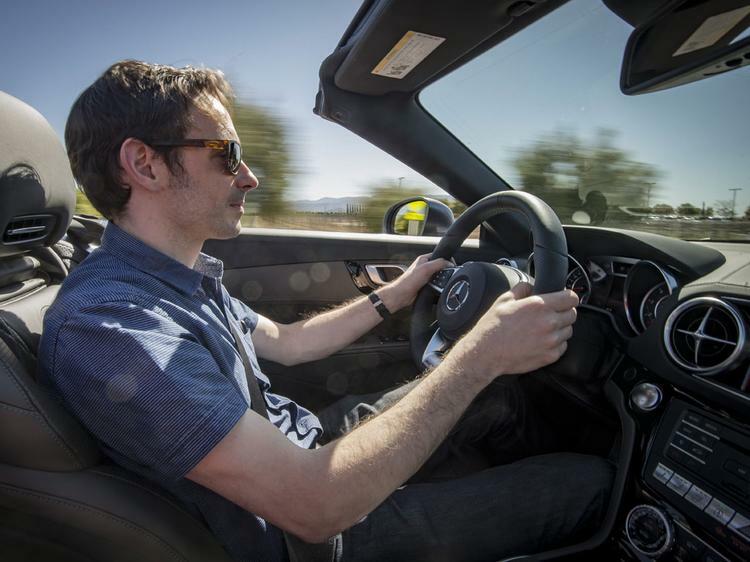 As a living-the-dream SL65 owner it's entirely probable your passenger seat occupant will be more glamorous and less powerfully built than another sleep-deprived motoring journalist. 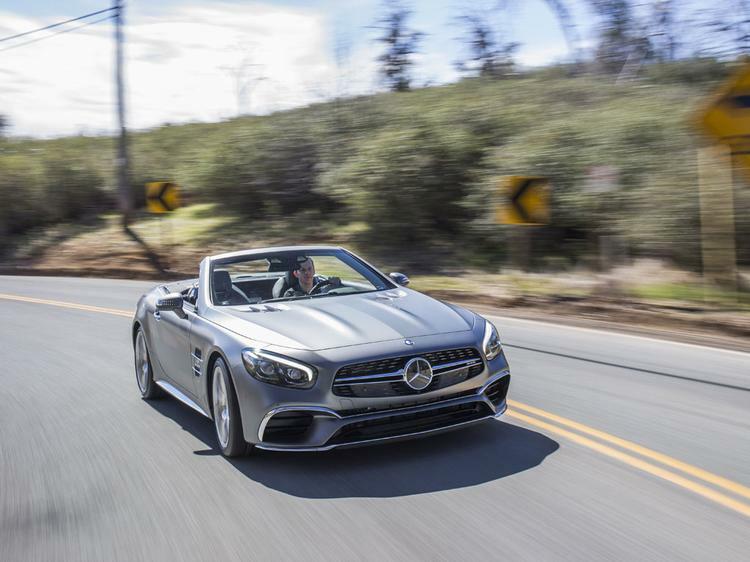 But there's no escaping by the time you have two fully grown occupants in the V12 SL it's a two-tonne car, aluminium construction or not. 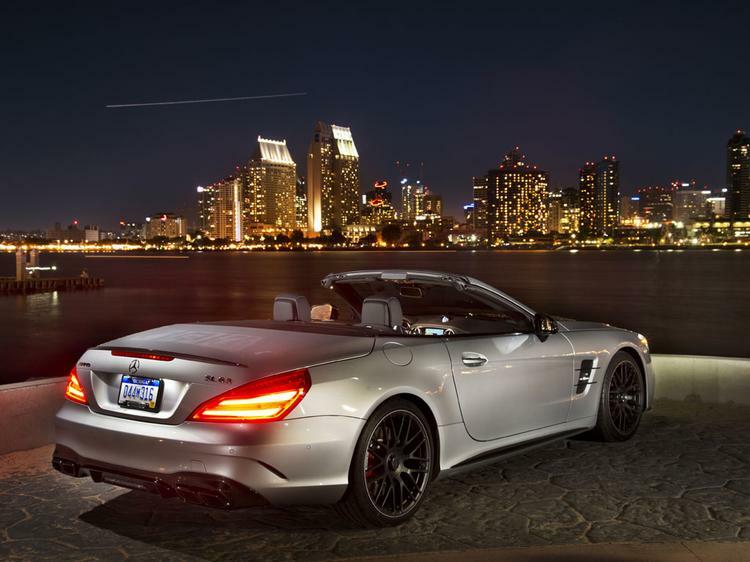 Not necessarily a worry when you've got 630hp and 737lb ft of torque and status to maintain when the lights go green. But one number on the spec sheet you might not be so keen to boast about. 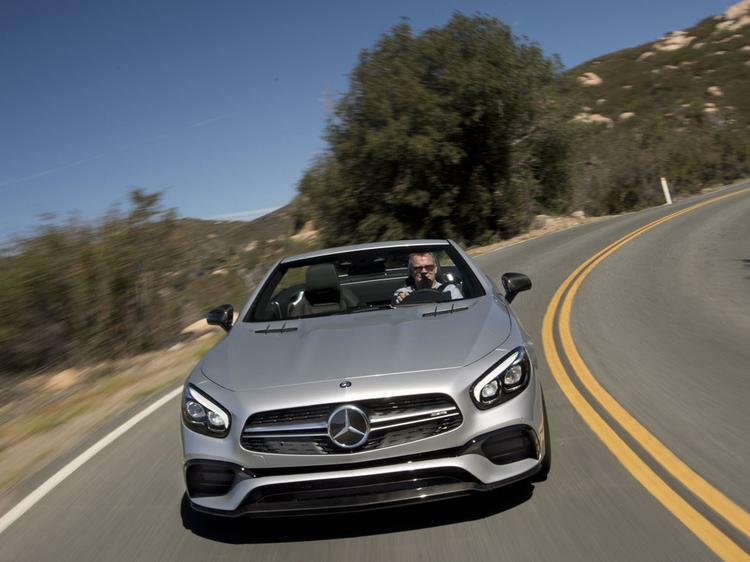 The cosmetic transformation for this revised SL are relatively less dramatic for the AMG versions, though there's no denying the sleeker front end looks more purposeful and helps resolve the proportions a tad. 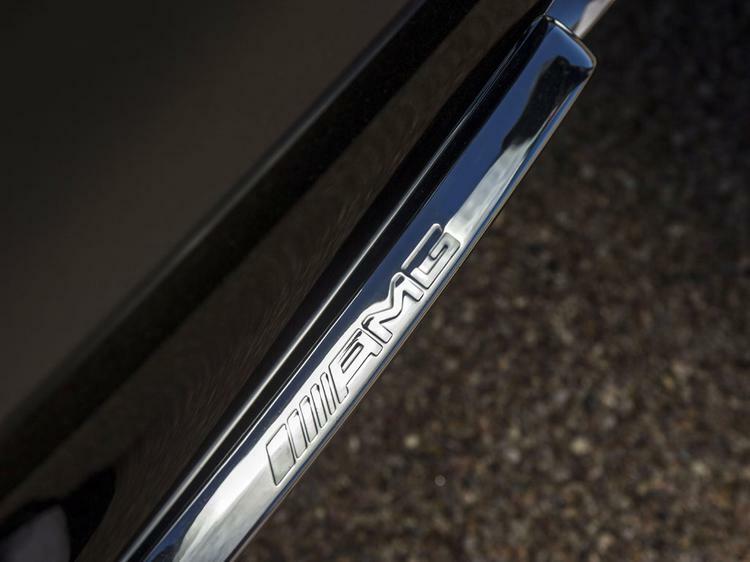 Less said about the awful side vents with their filled in 'mesh' trim the better though; at least on the AMG versions you've got the distraction of a public statement of your wealth according to whether the Biturbo script is prefixed 'V8' or 'V12'. 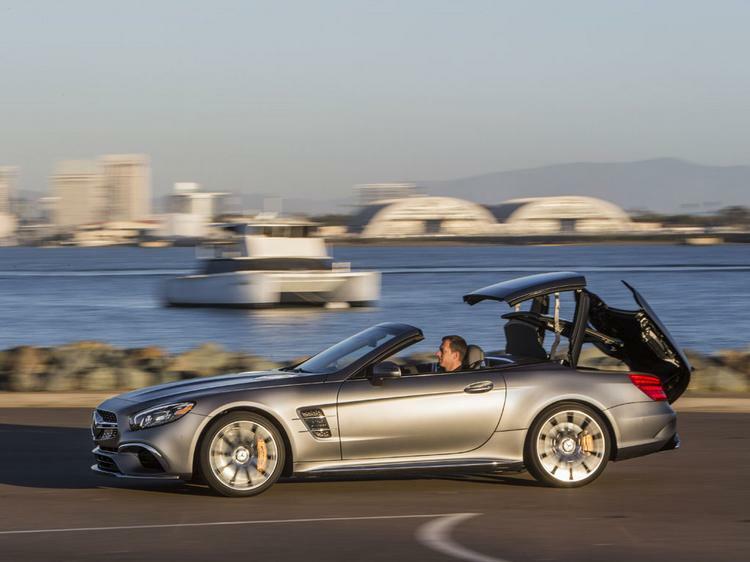 It's California so, naturally, the roof is already down, the better to hear ... oh. Yes, for all its massive power the '65, like all those previous to wear the badge, sounds a little truck-like, a light whistle of turbos accompanying a gruff gargle of exhaust noise from the squared-off tailpipes. Some childish and deeply unscientific to-and-fro with some fellow journos in an SL63 reveals the '65 does indeed lay down its authority off the line, even with what you suspect is some electronic tempering of the 737lb ft of torque to prevent leaving a trail of transmission components in your wake. As the traffic clears and the road climbs into the mountains our man in the '63 seems a lot happier though, quickly disappearing into the distance as the road twists and turns through canyons, hairpins and wicked changes in camber. Let's be clear; this is on a public road and American traffic police aren't noted for their sense of humour. Or reticence about shooting first and asking questions later. Even with this in mind there's no doubt of the SL65's ability to very quickly shrink the distance between the corners. It's just once in them it's hard to find the confidence to carry much of that speed through the turn. The damping is brilliantly judged, the parallel Active Body Control servos using hydraulic pressure rather than twisted metal bars to contain body roll and more besides. 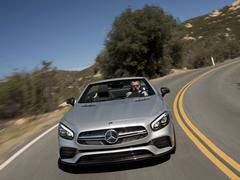 Mercedes has many years experience in perfecting this system and it really shows. The really impressive thing about this SL - unchanged from the pre-facelift car - is the stiffness of the aluminium structure. 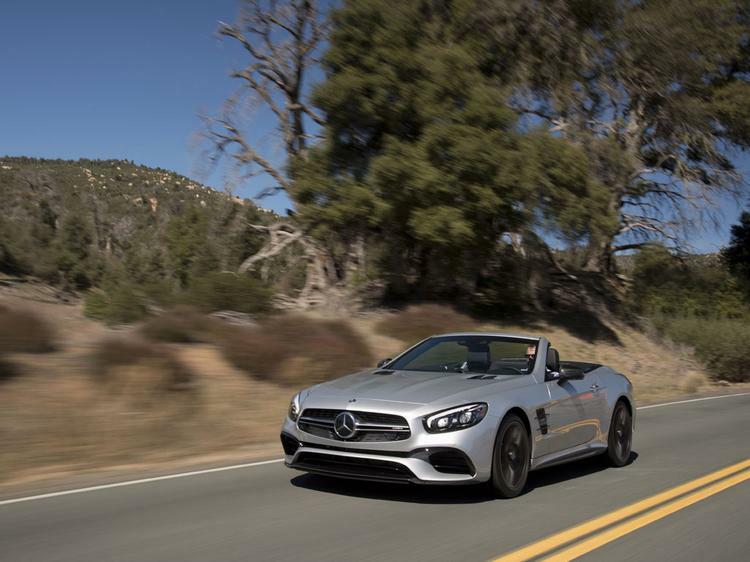 It gives AMG opportunity to run spring and damper rates sufficient to support the performance and yet, even in the stiffer damper setting, there's not even a trace of shudder or shimmy through the body. What lets the '65 down is the feedback through the wheel. And possibly the weight. How much of the additional 105kg over the '63 is engine - and therefore in the nose - isn't clear. 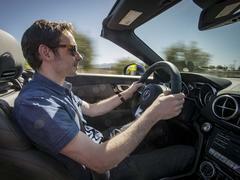 But light steering and nose-heavy momentum isn't especially confidence inspiring. And it'd take serious speed limit denial to apply the straight-line speed advantage to make up the gap. 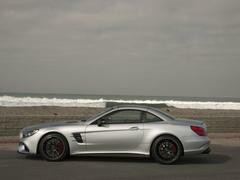 Upon swapping to the SL63 it's clear why we were so easily gapped. Since going turbocharged with the R231 the SL63 has got dangerously close to stepping on the toes of the 65, the performance gap previously much greater when the R230 SL63 still used the normally aspirated 6.2-litre engine. Back then the difference between revvy, normally aspirated '63 and thumping, turbocharged '65 was significant; now they're very much two sides of the same coin in terms of character and, indeed, actual performance. 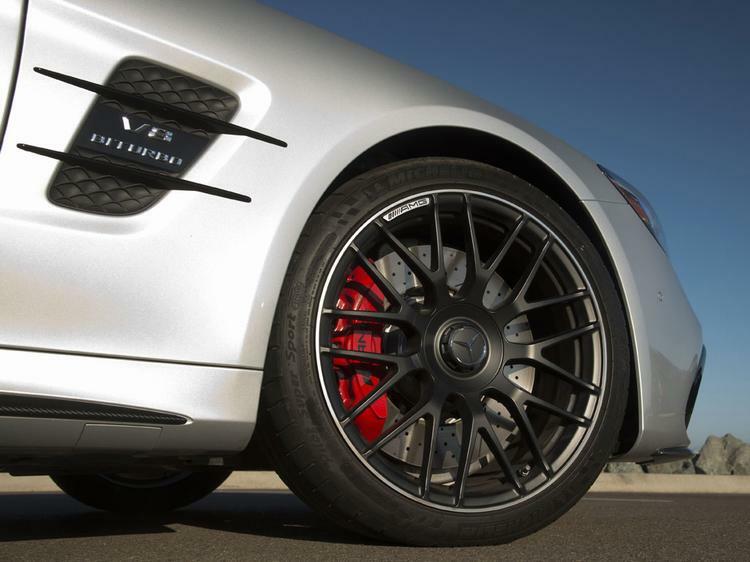 The V8 also gets AMG's snappier wet-clutched automatic MCT gearbox where the V12 uses the more conventional torque convertor 7G-Tronic, albeit with AMG tuning. Unique to the V8 there's also an additional AMG Performance Suspension option costing a further £1,570. Apparently none of the launch fleet have it but even the standard chassis feels subjectively sharper and more responsive. 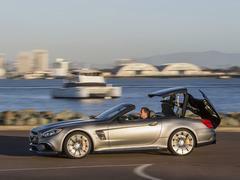 For whatever reason there's seemingly more bite and weight to the steering (both AMGs get a linear rack over the standard car's variable one), a greater eagerness to turn in. The previously optional mechanical limited-slip differential is now standard, offering greater opportunity to adjust the cornering balance on the throttle too. 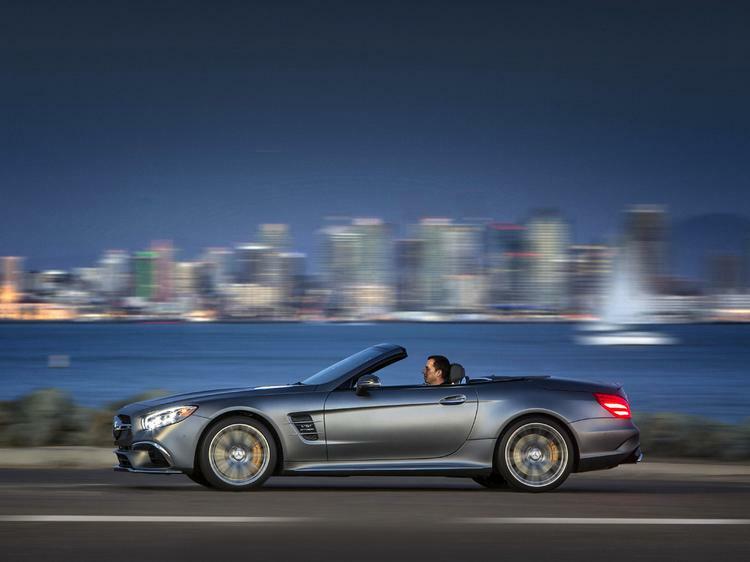 And the power delivery of the twin-turbo V8 offers plenty of opportunity for that. This 5.5-litre unit remains an absolute animal of an engine. The extra cubic capacity means none of the initial softness of the new downsized 4.0, the massive 664lb ft of torque seemingly there on-demand and the surge never less than shocking. This is a massively, massively rapid car. 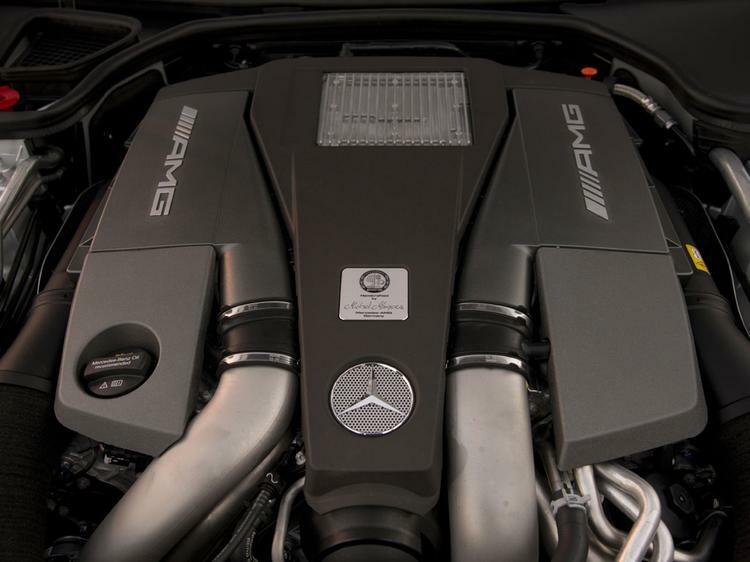 The noise, if breathier and a little artificial compared with the old naturally aspirated V8 or even the supercharged one of the old SL55, is better than the V12 too. It's still a big, heavy car. And there's nothing subtle about the performance or way it's delivered. But the '63 just comes across as more fun. 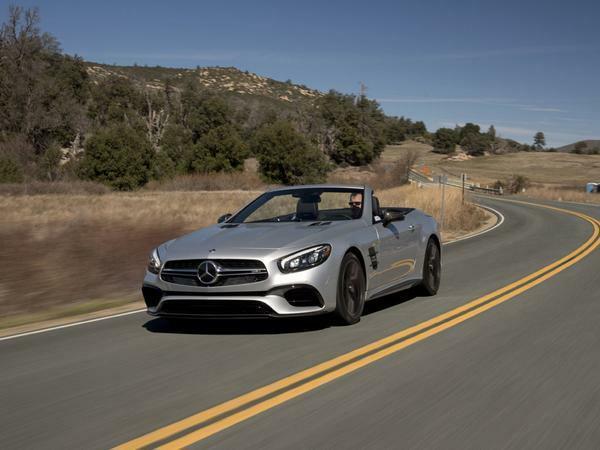 Fast SLs have always occupied their own ground but in attempting to put the '63 into context it manages to have some of the macho thrill of something like an F-Type R but with the sophistication and maturity of a 911 Cabriolet or Targa. 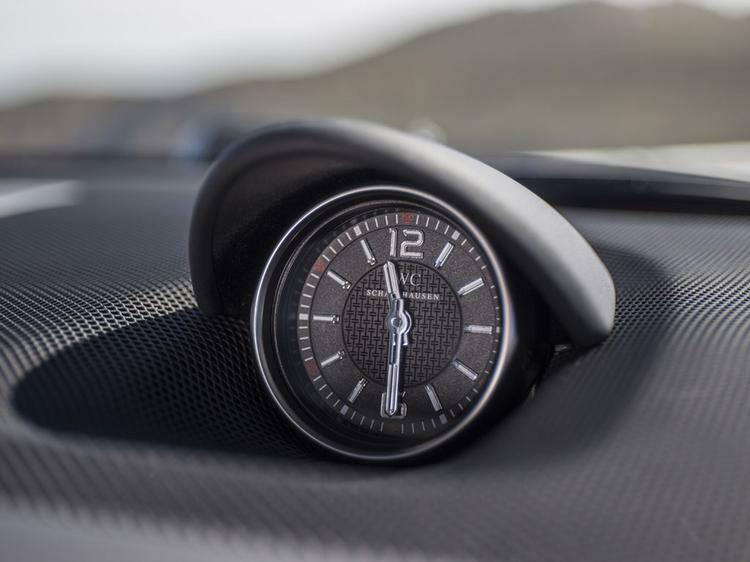 In the case of the V12 '65 it's, again, an unapologetically brawny slap-down to the Ferrari California T while offering a more rounded alternative to an Aston Martin Vanquish Volante. For all the SL65's profligate performance and gleeful excess there's little doubt the better car is the 'junior' V8. In any meaningful sense it's just as fast and, subjectively, it's just more enjoyable and fun to be around. The front overhangs on these cars just kill them for me. They look horrendous. I think that's the problem for a lot of cars recently. Pedestrian crash regs or some such I think or perhaps the industry has collectively decided two feet of extra car in front of the front wheels looks nice. I miss supercharged AMG V8s. It's a nice looking car and all, but if you're spending that kind of money on a car, do you really give a stuff about being well into the top end of the VED bands? I think the article nails an important point here, with the move to turbo in the '63, the gap between them is so much less. I absolutely love that the '65 exists, but the argument for it seems even less now they're both powered by similar units.